It’s time for spring clean-up! All that pruning and raking will undoubtedly produce some big piles of yard scraps. Consider creating for yourself a compost pile. Read on to see a few reasons why and to get some info on how to get started. According to The Center for Sustainability at Duke University, the average American generates 4.3 pounds of waste per day. So, if you and I are average, we will each produce m ore than 1500 pounds of garbage by the end of this year. There is an alternative for much of the garbage waste that is currently sent to landfills. That alternative is composting. In this article, I’ll define what compost is, explain the potential correlations between composting and our environment, and introduce the basic elements of how to compost. Let’s start by exploring the concept of composting. Compost is decomposed organic material. According to the Illinois State Extension, (https://extension.illinois.edu/compost/process.cfm) compost is made with material such as leaves, shredded twigs, and kitchen scraps from plants. Enriches soil, helping retain moisture and suppress diseases and pests. Balance your pile by adding “browns” (to add carbon) and “greens” (to add nitrogen) in order to create the chemical reaction necessary for the composting process. Brown materials include : Leaves, Twigs, Shredded newspaper, Cardboard rolls, Clean paper, and Fireplace ashes. Green materials include: Fruit and Vegetable scraps, Grass clippings, Bread and grains, Coffee grounds and used tea bags, Hair and fur, and Manure from animals that are herbivores such as cows, horses, sheep and goats. Do not use: Dairy, meats, bones, fats, oils, pet waste from dogs or cats, seafood scraps, plastics, stickers from fruit and vegetables, metals, glass, treated or painted wood. Here at Lomond View Nursery, we also sell granular nitrogen. Adding this to your pile will speed up and aid the composting process of your pile. Add water to dampen and speed up the decomposing work of the bacteria. Turn once a month to reintroduce oxygen to the center of the pile. 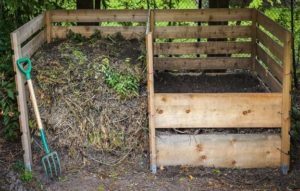 (http://northparknursery.com/2015/08/how-to-composting-basics/, n.d.) Depending on the temperature outside and amount of heat producing nitrogen included, your pile will be composted and ready for use in approximately 3-6 months. So now that you know a little more about what compost is and how to make it, take all those piles from your spring clean-up and make compost pile instead of sending it to the land fill! Michel, F. (Summer 2010, Vol. 18 Issue 3). Compost: Benefits vs. Risks. Compost Science & Utilization, 137-137.